I’ve worked with a lot of students since I began teaching in 1987. Not just different nationalities, but students who came with all kinds of challenges and strengths. I marveled at the myriad personalities that I got to work with — some malleable, trusting and easy going, others requiring a more sensitive approach to get them to open up, still others needing me to grow a thicker skin and nerves of steel. I’ve seen it all, the whole spectrum and then some. Many have come to mind in reflection in this past year, always with gratitude for all they taught me, especially the challenges. Now, at St. Aidan’s, I’ve been privileged to work with a new type of student — the new Canadian who must learn to speak English. I have worked with these young people since last fall, and have enjoyed the challenge of introducing a new alphabet, with new sounds, to them. Some have already accepted their new status and are more than ready to learn, others are still longing for their homeland and reluctant. I’m sure I barely understand the effects of the reasons they fled their country to begin with. The long, fancy explanations teachers are so fond of giving, as a “sage on a stage,” no longer work (oh wait, they never did). Now I depend on gestures, simple words and acting to get the meanings out. Sometimes I get smiles of comprehension, other times I get puzzled looks. How do you explain that the letter “a” is sometimes long, sometimes short? Or that “c” can be pronounced two ways? English seems cruel with all its exceptions and rules that break. 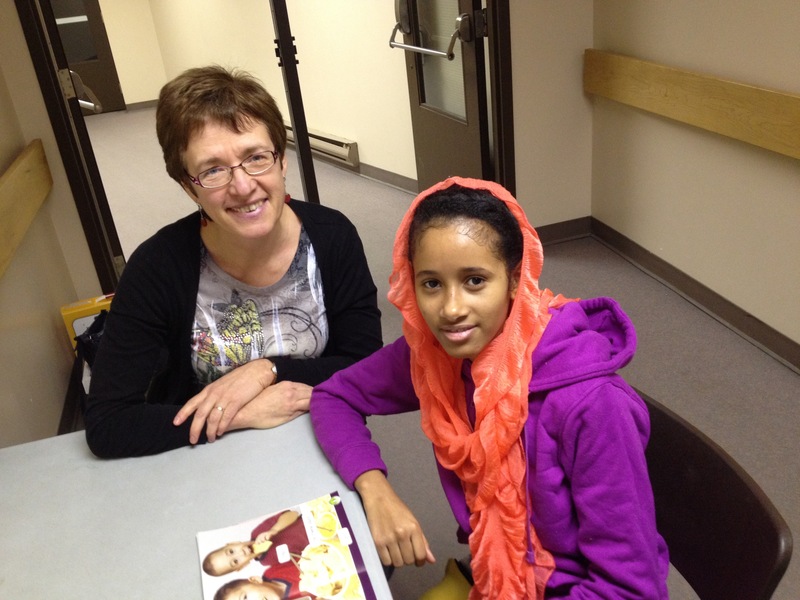 Once, I brought an Arabic/English picture dictionary from the library to go over with Stephania, a new student from Eritrea. She showed her alphabet and it was a good exercise in empathy for me. The characters of that language all seemed the same to me, the subtle differences incomprehensible to me but no doubt plain to her. I imitated the sounds Stephania spoke, but when she corrected how I said them, I didn’t understand my mistake. I tried to say them the way she did, thinking I’d aced it, but she kept shaking her head in laughter. I’ve often remembered that experience when I see students struggle with what seems obvious to me. For example, it never occurred to me before how similar the letters “t” and “f” look. Explaining something once doesn’t do the trick, it is a process that will be years in the making as they acquire a new language and a new culture. Any successful connection that occurs during a lesson is a joy. I’ve been a “new language learner” myself in the last year, as I’ve navigated my way through leaving full time teaching. My new dialect is the language of the “second half of life”. In the first half of life, I was preoccupied, as people rightly are before their 50’s, with establishing myself — career, home ownership, parenting…building a proper platform for my life. The game was all about establishing an identity. In teaching, I took courses, learned the latest programs, taught after school and lunch clubs, bravely staged concerts, and said yes to a lot of extras, as many, many teachers do. Life was all about the word “more”. Now life has become about less rather than more, and I am in the midst of a paradox with the new language I’m learning. Where my old language said, “Work hard. White knuckle your way through,” the new language is gently encouraging me to begin letting go, reminding me that less might translate to more. Until I was faced with the task of letting go, I didn’t know how tightly I’d been hanging on, as if it was the only identity I could have. But as I’ve been letting go, I feel I am gaining more in an upside down way. Saying no to the busy life I once led has felt like a loss, but there is new life springing up as well. 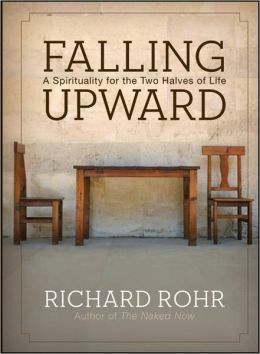 Author Richard Rohr describes this paradox beautifully in the phrase (and book) “Falling Upward”. At first glance, falling hardly seems to describe the first half of life. Isn’t it all about rising, achieving, accomplishing, and performing? I think falling refers, not to the first half of life, but to our transition into the second half of life. I didn’t have to manufacture the falling part, it happened when I couldn’t do it anymore. I think this must come naturally in every life. Letting go feels like falling, and falling always involves suffering of some kind. Suffering is never fun, but headaches have served to topple the illusion that I was in control, or that I could even build a tower of success. My little kingdom had to fail me. I’m so grateful I’ve heard God call me to a kingdom greater than my small self, which in Christian language Jesus calls the Kingdom of God. It’s what Rohr meant by the phrase “falling upward”. Now it’s no longer about me looking good, or making money. The picture has grown smaller in some ways, but in the most important ways, life has gotten bigger. I hope and pray that my life will have more of an inner generativity. God in the second half of life is showing me a way to do this as I’m writing and editing more than I ever have. Most days it feels like chicken scratches, but I’ve heard a clear call that this is where God has called me to. When I write, I feel like I am falling upward, falling towards God, falling in love. I feel I am where God wants me to be. Funny the way God gives us hints that He is at work in the world and in us. I’ve always been one to believe that nothing comes to us by accident. 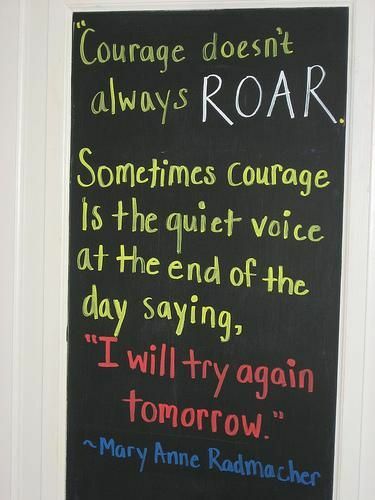 Believing that this is one of the ways God speaks, I began to think about what courage means. 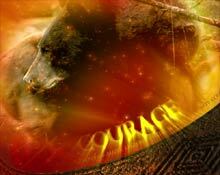 We all think of firefighters or soldiers when we think of courage. The image of entering danger and overcoming obstacles seems heroic, but we often forget the underside of these glamourous images. These people must exercise mental and moral strength to overcome their fears. I hung on to this quote all week. “I’ll try again tomorrow.” This became my prayer, and my reminder to move forward and keep growing in character and in God’s strength. 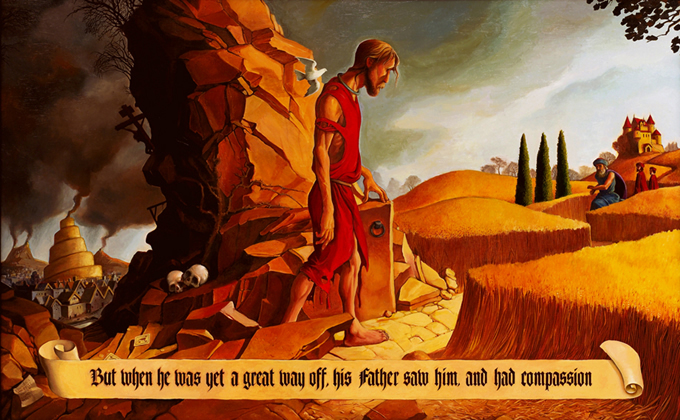 My temptation, like the crippled man, is to stay with the old self (often crippled by my sense of failure), but God tells me that the challenges of our lives build character and hope. God tells me that “In this world, you’ll have troubles, but I have overcome the world.” This is who I want to model my life after. This teaching has come to me at an important time. When I tell people I teach Grade ⅔, I am often met with admiration. It is probably considered a noble profession. What people don’t see in me are the fears that regularly bring me to my knees in prayer. I was supposed to teach about courage, but as always, I was the student most in need of the lesson. 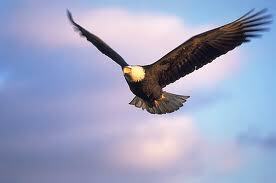 I saw God is with me, strengthening my courage legs every morning, replacing my fears with new hope. This week I am going to pull the lens away from my week and look at something God has used to help me over the years. The Bible has become a lifeline for me. It has pulled me away from dead-end ways of thinking and has given me new direction more times than I can count. It has kept me tethered to meaning and purpose, but it certainly wasn’t always that way. This topic occurred to me this week because I’m one of three people presenting a short book review at Watershed’s next Wednesday night study. Paul Patterson, our pastor, gave many of us a book to read a few month’s back, with the question “How has this book changed your way of reading the Bible?” More on my book later. I’ve always grown up with the Bible being central in my family and church, but I can’t say I really read it for myself as a kid. I listened to stories in Sunday School and elementary school (yes, they read us a Bible story every morning. That was a different era.) Preachers preached from it every Sunday, but it never occurred to me to read it on my own. In junior high, a new edition of the New Testament called “The Living Bible” came out, designed just for kids like me. Being a new paraphrase, the language was modern and fresh, and it had lots of photos of young people. I sat through many church services flipping through this book, studying the pictures and reading the intros to each chapter. 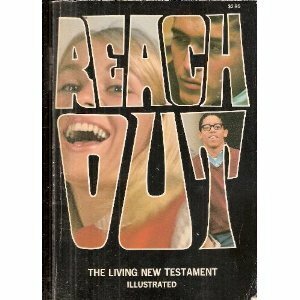 It was through this edition, called “Reach Out” and later called “The Way” which included both testaments, that I first had the inkling that the Bible could be relevant to a person’s life. The Bible wasn’t just something that was preached from every Sunday. As I grew up, I had several experiences of the Bible being a “living thing”, like the high school Bible study group that met each week through our church. I felt loved and cared for there through our very kind leaders Hans and Lorna Boge. I also studied the Bible while attending Mennonite Brethren Bible College in the 80’s, and I loved understanding the Bible in a deeper way. In both these places, scripture came alive. But it wasn’t until I experienced failure in later years that I began to embrace the Bible as a lifeline. Separation in my marriage (which wasn’t permanent, thank God), and struggles with depression brought me face to face with the reality that I needed something, Someone, to guide me. Failure becomes a gift when it brings a person to the place of dependence, needing to trust in something higher than themselves. Individualism and “doing it my way” is so rampant in our society that you don’t often hear about submitting to something outside yourself. But when doing it your own way just gets you in trouble, you become a seeker, and that’s what has happened to me. I began to trust in the Words that come to me through Scripture more than my often faulty ways of thinking. If you’ve been reading this blog, you’ll know that each week’s story is kinda the same – in some way, I’ve gotten lost and God keeps finding me. There’s a famous story about God being like a good shepherd who goes out looking for his lost sheep, and I keep being found like this, week after week. The book I was given to read is Eat This Book: A Conversation in the Art of Spiritual Reading, by Eugene Peterson. Through the fall, I read a chapter each week while exercising on the elliptical machine at the YMCA. When I was done and went to the weight machines, I left the book lying on the floor and often wondered what people thought of the book title’s command: “Eat this book”. The title is a reference to a passage in the New Testament book of Revelation. The writer of the book, John, is having a vision and he goes up to an angel who is holding a scroll. John wanted to read the scroll and asked for it, but he got a strange answer back. He was told that instead of reading it, he was supposed to take it and eat it. “It will be bitter to your stomach, but sweet as honey in your mouth,” the angel told him. Peterson uses this verse as the basis for his whole book, and like the title suggests, I’ve been chewing on its meaning for months. Eating something means it’s going to enter your bloodstream and your very muscles, giving energy for the day. It’s not something that happens merely in the mind or for a momentary taste sensation in the mouth, but in every part of you. It keeps us alive! As I crack the Bible open each morning during my prayer time before work, I’ve often asked myself – are these words going to stick, or will they just fall out of my ears the moment the rubber hits the road in the real world? Peterson’s book kept nudging me each day in recent months. Are you eating this as if your life depended on it? Most often I have to confess I don’t. As I’ve been getting ready for my book presentation, I’ve been wondering why so often I’m like that person in the mirror, who walks away and totally forgets what I look like in God’s eyes. I forget because I have a mistaken understanding of God. In a way I often come to the reading of scripture hiding my face, thinking I’ve got to have everything together before I’m accepted. No wonder the words often don’t stick. I’m not even listening. But God isn’t someone I need to hide from. Like the best friend imaginable, God always sees through to our essence, in the midst of our messy and muddy lives. We can bring it all to God, trusting that we are not employees before a critical review board, but beloved children. These words remind me that I don’t need to have it all together. In fact, when I look back, it’s always the mistakes I make which loosen the ground for God to get through to me. It’s a miracle really. When I have seen myself as forgiven and beloved, the whole world begins to look this way. Who wouldn’t want to eat those words. Each week, God gives me a feast to chew on. Some words are sweet like honey, bringing words of promise and blessing and consolation. Others are “bitter in the stomach” when they make me uncomfortable with the truths they bring. God’s words are sometimes difficult to digest and hard to obey, usually because my ego wants things to be easy. But my experience is that God’s words, whether sweet or bitter, always always lead to freedom and hope. May we all enter this week, bringing every part of our lives honestly to God, waiting to hear what God has to say. This week I found myself thinking about shoes a lot. The snow has started to fall in Winnipeg (finally), and several students came to school with no runners for gym. Off they trudged to the office, more than once, to borrow extra pairs. I myself made a trip to the basement to dig out my winter boots, leaving my daytime shoes at work. I wear practical black shoes, not as fashionable as some might wear, but they can double as runners if I decide to give my students an extra gym class or plop on the floor to help someone with their work. As practical as they are, they won’t do for my nephew’s wedding next weekend, nor will the boots! A trip to the shoe store may be in my future, or at least a rummage through my closet to see what is hiding in there. 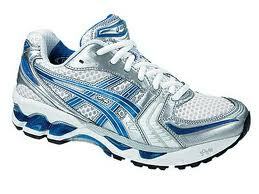 My favorite shoes are my runners, and I was wearing them on the treadmill this week at the Y, listening to a podcast. I heard a great quotation, which stayed with me. “We walk in shoes that are too small,” Carl Jung once said. I think what Jung meant was that many of us (myself included) think that we are flawed, born sinful and incompetent. When we think that’s all there is to the picture, we forget that we are also blessed and noble creatures, born to love others as God loves us. Just as tight, uncomfortable shoes can keep us from walking or running very far or very often, tight, uncomfortable thoughts can make us into unhealthy people with too-narrow boundaries on our lives. I’ve often been guilty of wearing shoes that are too small; of forgetting that God’s world is one of freedom and emancipation. So, to answer the question of this blog, this week I noticed that my shoes felt bigger. Maybe I’ve always had these shoes from God, but I became a bit more aware of them on my feet, making my world a bit bigger. Richard Rohr (in one of his daily email meditations that I highly recommend) wrote “Why do I have this new desire, this new capacity to love some new people, to love the old people better, maybe to enter into some kind of new love for the world? I even find my thoughts are more immediately loving.” He goes on to say that this new capacity is always from God. I read this quotation and found myself nodding. “This is what I feel lately,” I thought. I love people. Maybe it’s weird that at age 50, I am still in recovery from a lifetime of less hopeful thoughts, but there it is. It’s not like until now I’ve been without love for people and life, but there was something in me this week that felt new. Like the old boundaries were being pushed away. Like my shoes were bigger. I thought of his story this week as an awareness stayed with me of how expansive life is. One expansive place is the kids at school. I certainly don’t do it perfectly, but there is joy in being an encouraging guide to these little people who are still so open to life. It’s a crazy and busy life being a teacher, but it is a huge privilege to be with them. Many are affected by poverty and issues I’ve never had to deal with, but they are my teachers every day. I have to admit, however, that by week’s end, old habits of burn-out crept up again, and this sense of awareness left me. But I kept remembering the bigger shoes. Was what I saw true? What would it mean to keep living in God’s expansive world, pushing forward in hope? On Friday night, as my husband can attest, I certainly didn’t feel hopeful. Life felt scattered and too-small again as the day’s challenges just felt like too much. Writing this blog has become a spiritual practice that helps me immeasurably each week to stay focused on faith. More than anything else in life, I desire to keep my lens focused on God and the universe of God’s love. Like the galaxies around our tiny earth, it is much, much bigger than we imagine. A continual proof of God’s love is that even when I forget, God never does. God is ever merciful, renewing me when I’m spent, reminding me to put on the bigger shoes. Jesus showed us what to ask for when we pray. “Thy Kingdom come.” Thy Kingdom come dear God, even when our shoes are pinching and we’ve forgotten. Here is a prayer for American Thanksgiving. Henry Krahn would have loved it. This last Tuesday, my friend Lorna gave me a ride to work after I dropped my car off for a tune up and the switch to winter tires. We work close to each other so we sometimes help each other out. Talking to a good friend, however briefly, is always a great way to start the day. “How are you doing?” she and I both asked each other in the 7 minute ride. She was battling a headache, and I the edges of depression, but our quick conversation didn’t become a complaining session. We both reflected on stuff we’d been reading and we mused on how so often we get stuck in thinking these human battles are who we are. The day before, I had stopped off at Safeway on my way home, and I realized how incredibly tired I felt. Walking through the aisles, all I kept thinking was how I felt dead inside. I kept remembering that “this too shall pass,” and of course it did, but it’s amazing how tempting these times are. I am tempted to think the passing clouds are the only story there is, but we are so much more than these passing human battles. “Lady Wisdom” (wisdom is often personified in the Bible) can weave her way through our lives, no matter how we’re feeling. We had talked about her in Watershed’s Sunday service the day before and I wondered what she would have to say to me in my tired state here in Safeway. What would she say as Sunday’s wisdom met the grind of Monday? In reflecting back over the week, this little interchange is what kept popping up as where I saw God bringing wisdom to bear on my very human life. Like a stone dropped in a pond, the words were small, but they kept rippling in my thoughts. God used Lorna, and I heard the words as a whisper in my ear, reminding me of the bigger picture. I was reminded of Richard Rohr’s words in the daily email meditations I receive. He said this week that our life’s pains, such as they are, teach us a paradoxical lesson – that we must go down before we even know what up is. Like the title of a book from my childhood, Up the Down Staircase (anyone remember that one? ), the way “up” to wisdom often seems to happen whenever we are on the “down staircase” and in some kind of normal human pain – pain that Rohr defines as simply “whenever we are not in control”. I don’t know about you, but my first impulse is to resist pain by complaining and letting negative thoughts run rampant. What I’m finding is that this only leads to more pain. It’s like the lesson I learned at my pre-natal classes, over 20 years ago now – breathing deeply and facing the pain as calmly as possible helps you move through it. Bracing against it makes it worse. For me, breathing deeply looks like this – remembering moment by moment that God can always transform our wounds into sacred wounds, and help us find deeper meaning in them. It’s like I have to make a conscious choice to send my thoughts there, instead of toward darker thoughts. God can use any situation for good. Remembering this is like taking a deep breath, giving my often jumbled emotions to God, and asking God to give me strength to face the day with courage and wisdom. And like I often remember, I have never yet been let down by God. I think the friends at my house church would say the same thing. 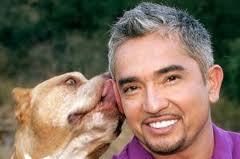 As I watched the Dog Whisperer (one of my favorite shows) with Lyle this week, I realized God/Lady Wisdom is like the dog whisperer, taming the wild beast in us that would otherwise keep wreaking havoc. We saw how Cesar Milan hold a dog gently but firmly, letting the dog thrash around until it got the idea that there was another way. It could let go of its fear and impulses and surrender to the trainer. We saw a snarly beast (whose only future up to that point was euthanization because it was such a danger), transform into the unconditionally loving gift that dogs are created to be. The transformation needed reinforcement over the next while, but it happened. One of my favorite pictures about Lady Wisdom is in Proverbs 1:20: “Wisdom calls aloud in the street, she raises her voice in the public squares.” She doesn’t call out to us once we have it “all together” in some ivory tower, but in the nitty gritty of every day. The public squares the verse refers to was the open market of ancient times. Vendors would call out, advertising their wares. I remembered my time in Israel as we walked through the open market. Small shops on either side of us were never quiet. Just like the verse says, we heard everyone hollering for us to come look at the deal that was better than all others. Lady Wisdom is like one of these vendors, shouting “Hey you! Come over here! 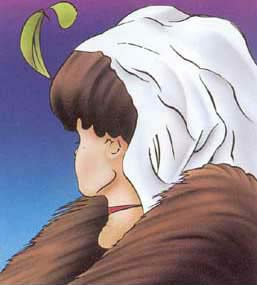 I’ve got something better than what you’re trying!” Like the classic optical illusion of the old lady/young lady, we can choose to see her. I felt grateful all week that she called out to me. I seem to have a major memory problem and I keep forgetting all the things she teaches as I fall into the same old habits, but lucky for me, she is always calling out, always speaking, always reminding me of who I am. As I’ve been writing this blog over the months and asking “Where was God in my day?”, I’ve become more aware of the many ways God speaks. God can use the smallest thing to start painting a picture in my head of “God thoughts” which then weave through my heart all week, anchoring me in an identity deeper than my human foibles. It has become a rich discipline to keep asking the question, even during difficult times. I marvel that I have never yet been let down. One of my favorite Christian authors, Richard Rohr, says that “we live inside of an unexplainable hope” when we live in co-operation with God. But let me get to this week’s story. Last Sunday, I was heading out the door after Watershed’s Sunday morning service and lunch potluck when I had a brief conversation with my friend Lorna. “What do you have up for the rest of today?” she asked me. I told her it was going to be a full day and week ahead as my Math and Language Arts testing results were due. Without missing a beat, she gave me a reply that woke me up in my worried state. “It’ll build your character,” she replied. We talked about that briefly and then off I went to an afternoon of marking. Her comment, as small as it was, was like someone pulling a 180 degree turn in a car. I hadn’t realized how much I had been assuming that I would be overwhelmed, burned out and somewhat miserable this week with the looming deadline. Lorna reminded me that life can look different when we let God transform our ways. This was the small thought which began to sprout like a seed all week. “Where was God this week?” you ask. God was in this simple reminder from my friend. I began to realize how much habits of thought can take over our brains until they seem “normal”. Isn’t it normal to get burned out by outer circumstances? This strikes me as obviously false as I type it out right now, but I had to admit that I was stopped in my tracks as I’d been consigning myself to “normal”. I am a creature of habit. I notice it when someone invites me to a spontaneous plan, like going for an unexpected walk. Immediately my routines tempt me to say an automatic no. But sometimes we need to be jarred out of our routines, especially when they no longer give life. And so the prayers came out every morning, “God, help me with this load. Keep my imagination anchored in You.” I remembered the verse Lorna gave me, and kept on exercising and praying for perseverance and character, co-operating with God who gives birth to hope. I’m not saying I lived it perfectly, but more than less, I found myself more at peace in the bigger picture all week. And the marks got handed in without as much pain as I expected. 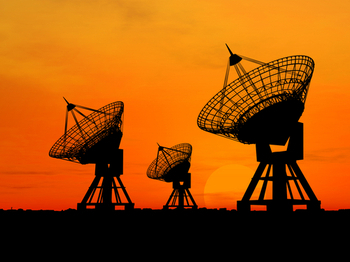 These receptors are trying to pick up radio signals from alien civilizations - now that takes listening! I thank my faith friend Lorna who switched my radio dial for me and reminded me to stay tethered in God’s hope. My new friend, Fana (who I wrote about in an earlier blogpost), from Habitat for Humanity phoned me up this week to say hi. I felt encouraged that she remembered me and it was great to talk to her. She’s looking forward to moving into her new house in December. My son Joel was brave in rescuing a woman, likely a prostitute, who was getting beaten up in a truck. He stared the guy down who then stepped on the gas after dumping the woman out the door. Joel drove her home and gave her some money, after convincing her he wasn’t a cop. Joel did a “Jesus thing”. I’m also grateful he was safe at the end of the story.